Barry Lambert: "Bad laws deserve to be broken. I am fully supportive. It is the right thing to do." Barry Lambert is gazing out the picture window of his Sydney home at a multimillion-dollar beach view. Around him his grandchildren fiddle on their phones while his wife Joy sips tea. Lambert drinks a cappuccino he’s just bought at the local café. It’s a charming family scene – except for one thing. At the table beside him, his son Michael is committing a crime that carries a sentence of up to two years’ jail. Michael, 44, takes out a tube that says “Hemp Oil 20 per cent CBD”, squeezes it and smears the brown paste onto a corn chip which he then gives to his daughter Katelyn, who is draped sleepily on her mother Saowalak’s lap. Katelyn, Lambert’s four-year-old granddaughter, wakes briefly and chews on the chip. The oil is an extract of cannabis, a substance prohibited under the NSW Drug Misuse and Trafficking Act of 1985. It is being used to treat a dangerous form of childhood epilepsy known as Dravet syndrome, although there is as yet little hard evidence to prove its effectiveness. 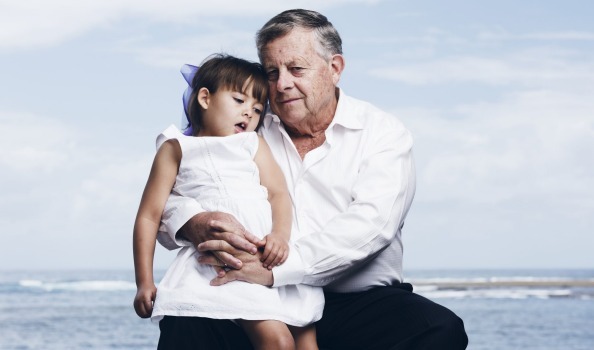 Asked how he feels about the use of an illegal cannabis product to treat Katelyn, the 70-year-old Lambert, who has sat quietly as his family squawks and scraps around him, pauses a little awkwardly before answering softly but firmly. Until last year Barry Lambert was known in Australian business circles chiefly for his success in building Count Financial, a chain of accounting and financial planning shopfronts that he started 35 years ago and eventually sold to the Commonwealth Bank for more than $373 million. That 2011 sale landed him a spot on the BRW Rich 200, where he was ranked the 156th wealthiest Australian last year. So it was a surprise when Lambert publicly associated himself with the cause of medicinal cannabis. With little warning, he gave a press conference in August at which he announced that he and his family would donate $34 million to the University of Sydney for what is called the Lambert Initiative for Cannabinoid Therapeutics. Lambert’s mind-boggling donation has put him at the crossroads of some of the most difficult issues in health, ethics and business. Suffering families welcomed the boost he has given to research that could benefit thousands, if not millions, of sick people. Police and conservative politicians, however, worry that medicinal cannabis will be a Trojan horse for legalisation of recreational drugs and quack therapies. There are also doctors who will not recommend medicinal cannabis given its still unproven benefits. Ingrid Scheffer, professor at Melbourne University and the Florey Institute of Neuroscience and Mental Health, is one of them. The world expert in paediatric neurology, to whom the Lamberts turned for advice, says cannabis is potentially beneficial in some cases but has been hyped. “It is not a silver bullet.” She says she is not yet able to recommend it because so far there is no hard scientific evidence of its benefits in treating epilepsy, although she is optimistic that proper clinical trials will give an answer in the very near future. Jaime Montalvo–Guest Editorial WDRB, Louisville, Ky. I have Multiple Sclerosis. I’ve been fighting this disease for eight years. I have muscle spasms, tremor uncontrollably, and I’m scared. Cannabis relieves these symptoms. In Kentucky, thousands of Veterans suffer from PTSD and haven’t responded to treatment. Sadly, too many choose suicide as a last resort for escaping their demons. I have personal combat veteran friends who testify that smoking Cannabis relieves them within seconds after waking up from horrendous nightmares. Kentucky has the highest cancer death rate of all 50 states. You probably know someone who has had cancer. Cancer treatments also bring some of the most debilitating side effects. Twenty thousand Kentuckians a year face this diagnosis. Marijuana has been studied and proven to relieve these effects. 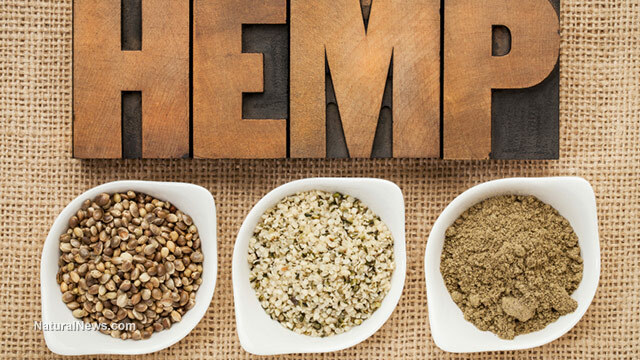 The nausea brought about by chemotherapy is relieved within seconds of inhaling Cannabis. The Epilepsy Foundation of Kentuckiana reports over 90,000 individuals suffer from epilepsy in our area. Like cancer treatments, medications used to manage seizures have debilitating side effects. Not every patient can tolerate the treatments, and the drugs often stop working. Cannabis oil has been heralded for decreasing certain patients’ seizures from 300 per week to zero or one. Cannabis is helping us cope with our symptoms. Please help us by contacting your legislator at 800-372-7181 asking them to support medical marijuana legislation. 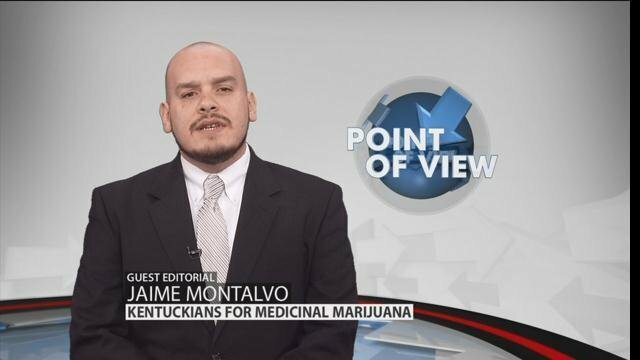 I’m Jaime Montalvo, founder of Kentuckians for Medicinal Marijuana, and that’s my point of view.